The Kirk Gallery & Café is a showcase of Sheila Fleet’s beautiful jewellery designs within an inspiring gallery space, and complemented by some incredible, locally-made food in the adjoining Kirk Café. This beautifully-renovated former church stands in the grounds of the Sheila Fleet Jewellery Workshop in Tankerness, Orkney. Browse Sheila’s designs in purpose-built display cabinets while soft-coloured light streams in through the Kirk’s original stained glass windows. Admire the spacious interior, which includes examples of traditional Orkney stone-work combined with a touch of architectural inspiration from Sheila’s travels. The original pulpit, brass lamps and other Kirk details all enhance the feeling of this special place. ‘Take a pew’ in the Kirk Café and enjoy some sensational food. 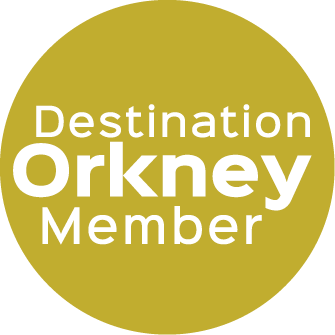 It’s the perfect place to savour delicious Orkney fare as you consider that special purchase. Browse the day’s specials, displayed on the Kirk’s original hymn board. Settle down on one of the Kirk’s original church pews, expertly transformed into cosy, cushioned seats by local craftsman, Leo Kerr. Or take a seat at our large, central table; its shape reminiscent of a boat, and a gesture to the old story that some of the Kirk’s rafters came from a shipwreck. Our oak chairs are also very special and feature stained glass reclaimed from some of the Kirk’s windows. The Kirk Café caters for a range of dietary requirements and the menu is a delicious mix of local delicacies and produce. Whether you’d like to try some Orkney meat, ham, fish or seafood, something simple or more elaborate, a cold snack or hot meal, you’ll find a dish that appeals to your taste buds. The Bere Benedict and Bere Royale are two Kirk Café specialities and feature Orkney-grown bere, an old form of barley, with a choice of local butcher’s ham or locally smoked salmon respectively. All our coffees have been uniquely blended for Sheila Fleet by the Orkney Roastery, while all the teas are exclusively prepared by the Tea Lovers Company in St Andrews, Scotland. There is a special ‘Peedie Folk’ menu for our young guests, as well as unique high chairs, illustrated by Gina Ramsay, and colouring sheets to keep them busy. The Kirk Gallery & Café is also fully wheelchair accessible. Note: The Kirk Café serves drinks and homebakes all day. Hot food is served daily 11am–3pm. Closed Christmas Day, Boxing Day, January 1st & 2nd.